I just gave a talk this morning to a gathering of special recreation league professionals called "Disability is Diversity." I plan to do a lot of writing and speaking around this issue in the coming year, so expect more (or bring me to talk to your organization or school!). In the meantime, though, here's a set of linked questions. I am interested in the way that higher ed does or does not link disability and diversity in terms of policy, administrative organization, and iconography. 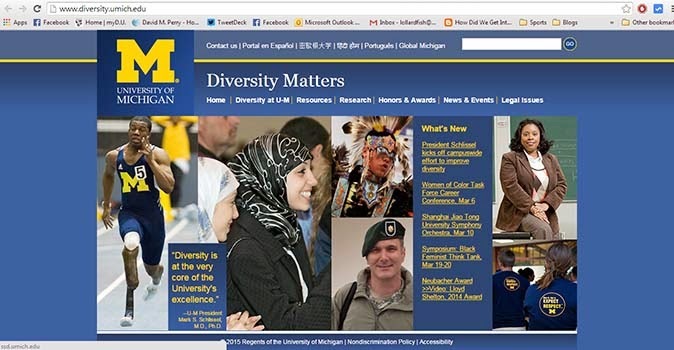 Most universities, so far, put disability and ADA compliance as a sub-heading within their general diversity website, do not display visibly disabled individuals, and do not "celebrate" disability as part of their diversity initiatives. Instead, diversity largely means race/religion. Here's an exception, from Michigan. This image shows an African-American man with a prosthetic limb, two Muslim women of color, a Native American in traditional gear, a white male veteran, an Africa-American woman (older, so either an adult student or a teacher), and I think the back of a white guy with long hair wearing a slogan t-shirt "Expect Respect." It's all a little inspirational for my taste - I'd rather see a Native American just raising his hand in the classroom, and person with a prosthetic limb eating a donut, or whatever everyday activities we might imagine, but I understand the job of marketing is to MARKET. This markets diversity as race, gender, ability, occupation, age. Explicit invocation of sexuality is missing, but it's hard to know how to show that without being stereotyped. Anyway, given the context, I think this set of images is interesting. [UPDATE - A friend thinks that the person with their back to us is the "queer" image. It's possible]. So if you have time, take a look around at your university website, and tell me in comments, on Twitter, or my facebook page, what it is that you find. This is really just the beginning of a broader inquiry, not an attempt to render judgment. Here's some of the stakes, though, a post by Leah Smith of the Center for Disability Rights, on the exclusion of disability from diversity initiatives.